Samsung has been known to be carrying dual-SIM phones several years ago, even before its competitor brands introduced theirs here in the Philippines. 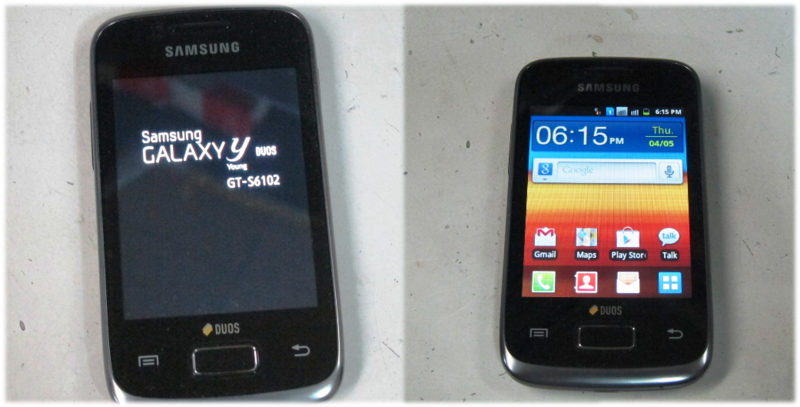 A few months back, Samsung has introduced another dual-SIM phone with a full touchscreen interface called Samsung Galaxy Y Duos GT-S6012. It is priced at Php8,990, pretty reasonable for a smartphone. The Samsung Galaxy Y Duos looks very simple. With its price, who am I to complain for its 3.14 inches screen? Surrounding the touchscreen is a glossy black surface with two touch-based labels (menu on the left and revert/escape on the right), plus a physical button at the center. The sides have a silver accent that extends towards the lower part of the the front surface. Using the phone easily attracts finger prints and smudges. On top of the phone (pictured left) is the 3.5 mm jack used to attach earphones or headset to listen to radio or used for hands-free calling. The small section at the center is also there to aid in opening the back cover of the phone. At the bottom part (pictured right) is the microUSB slot used for charging and connecting the phone to the computer. Used to having the volume controls of a smartphone on the right side, the Samsung Galaxy Y Duos gave me an unusual look when I saw the controls on the left side. Without any looking, at first I was trying to increase the volume using my pointer finger - only to find out I should now use my thumb in adjusting the volume of this phone. Veering towards the right side, the Galaxy Y Duos decided to put the power button on the upper section. The button is also covered with glossy black texture, which is good as compared to making use of rubber - since it easily gets destroyed. Surprisingly, there's no camera button on the same side. The back section of the Galaxy Y Duos is covered by the same glossy black texture as with its whole body. As such, fingerprints and smudges are easily attracted as well. Opening up the lid sees slots of two SIM cards and another for the microSD card (on the top-left). The battery is actually thin and light, so it doesn't actually add so much weight to 109 grams of total phone weight. The Samsung Galaxy Y Duos runs on Gingerbread 2.3 and works with certain limitations given it being a dual-SIM phone. As an example, I chose SIM1 as my main number for texting and calling, while SIM2 as the source of my data connection. Since it's on dual standby, I can still receive incoming calls and texts on SIM2 even if SIM1 is my main number. However, when I do outgoing calls and texts, SIM1 will be the number used by the phone - it doesn't give an option of which one to use for what task. Once the phone loads fully, the first screen I saw had the default widgets like the search bar, time and date, as well as frequently used basic applications. However, I can customize it up to three home screens by swiping to the left and right, so I can easily go to a particular application or immediately call a favorite contact without opening the menu. With an 832MHz processor, the Galaxy Y Duos performs quite okay. It's not one of those blazing fast phones, neither those that are very slow. Making use of the phone gives a pretty smooth flow while swiping here and there, but do expect a one to three seconds lag from time to time. It's normal. Messaging - whether your fingers are big or small, toggling from portrait or landscape can give you the flexibility of choosing which one works for you. In my case, using the landscape QWERTY is better, since the keys become a bit bigger therefore lessening the errors I make. Samsung Galaxy Y Duos has applications similar to that of other Android devices. Pictured above, for example, is for the setting up of multiple accounts such as Facebook, Twitter, MS Exchange, Google, and the very own Samsung account. It works like a one stop shop for all my accounts. Applications - I tried searching for certain applications, but failed to find them. So I came into conclusion that Google Play (Android Market) has filtered those that don't work for the Galaxy Y Duos. But don't worry, popular games such as Angry Birds, Fruit Ninja, etc. are available for download and can be played smoothly on the phone. Just a note though, unless there's a microSD card inserted to the phone, there's no way we can download any application, save files nor capture any images. This phone uses the normal music player that most Samsung phones have. It categorizes and arranges the audio files by Artists, Songs, Playlist, and Albums. Putting the volume to the highest level doesn't give so much clarity to the audio being played anymore. There's still room for improvement in terms of how high the volume can get, since it can hardly be heard when the background becomes a bit noisy. The browser of the Samsung Galaxy Y Duos is fast to load when coupled with a steady internet connection. It automatically detected the mobile version of Glich's Life and redirected me to the Youtube app when I clicked an embedded video in one of the pages of the site. In addition, the pinch to zoom feature aided me to read through texts with ease, especially since this phone does not come with very high resolution. Even with a not-so-expensive price, the Galaxy Y Duos still has the tethering feature, which I absolutely love. When connected to the computer, I can enable the 'USB tethering' option, which allows me to share my internet connection to my laptop and surf. If not, I can turn on the 'Portable Wi-Fi Hotspot' feature (as pictured above), so other devices like my BlackBerry 9700 (pictured on the left) can use the internet connection for surfing. As for the battery life, I find the Galaxy Y Duos' a superb one. Imagine, I've done a lot of surfing, calling, and texting the whole day and the battery still had about 40% of life. The next day, I tried using it at a minimum by doing only calls and texts, and it still lasted to more than half a day. Wow! The Galaxy Y Duos has a 3.15 megapixels camera, but is very disappointing. If you click on the photo to enlarge it, you'd see that all the shots are grainy, not sharp, and not vibrant in colors. The camera feature of this smartphone needs to be improved big time, since it does not have autofocus nor a zoom function. However, if there's one thing positive about the camera, it's definitely the fast shutter speed. For the price of a little bit lower than Php10,000, one will obviously buy this phone not primarily for its specifications but for its dual-SIM capability. It is very useful for business owners who often use more than one number to service the different networks of the clients. Yes, this phone is affordable, but not so much for those who are budget-conscious. If you don't really need the dual-SIM feature, I suggest you get the Samsung Galaxy Y for only Php5,990 instead. If you're also not keen on using the touchscreen due to big fingers, you'd probably be better off with another smartphone that has a physical keyboard. Apart from the very underwhelming camera, overall the Samsung Galaxy Y Duos GT-S6102 smartphone is worth the price, especially if you're looking into jumping to the Android OS bandwagon. However, don't limit yourself to this model as other brands may offer you a cheaper price with the same dual-SIM capability. That looks like a great deal Glenn. I wonder if you can use one line for data while the other one for calls. Will that be possible? This is flexible a gadget. he likes its features. Actually, he has Galaxy Y but not dual sim. Oh yeah, there's a Galaxy Y that came out first without the dual-sim capability. Glad he's liking it. Welcome. Hope your experience would be great! Interesting option for a dual SIM. Is this 3G too? Hi, I want to buy the Samsung galaxy y duos GT s6102 but tell me the one about the phone that can I receive the calls on both sim? And one question again that if I am using the two sims and when the coverage of first sim is not available then the second can still receive the calls if having the second sim coverage. When receiving calls and text, both SIM will function (meaning whether you choose SIM1, SIM2 calls and texts will also be received). But when doing outgoing calls and texts, only the SIM chosen will function. Switching between sim cards is very easy and quick. "As for the battery life, I find the Galaxy Y Duos' a superb one. Imagine, I've done a lot of surfing, calling, and texting the whole day and the battery still had about 40% of life. The next day, I tried using it at a minimum by doing only calls and texts, and it still lasted to more than half a day. Wow! " why are people on the other end of the line complaining they cant hear me wheras i can hear them clearly? sometimes they hear a beeping sound. HELP! Might not be a phone problem but a network problem. Meanwhile, check if your mouthpiece/phone's mic works by trying to record a voice note. would you please tell me... my connection to the internet is always at 3G speed or i can change it to 2G... ??? Look up the network settings and check if there's an option to change to 2G. whenever i make a call on the button version of this phone i hear a beeping sound before the call goes through, what is this ???? can i use a BIS subscription on this phone? if no, is there any cheap samsung subscription? A useless phone with hell of a lot of features with useless user manual that can not tell how to deactivate the call barring! I am receiving SMS from my service provider. It has no number. Whenever i swipe that log in my mobile, it is redirecting to a specific number. What can be the issue?